Meet Dr. Joel Kahn! In this class, world-renowned cardiologist, Dr. Kahn, will share a bit about his background, what this class is all about, and whether or not it may benefit you. If you want to live a long, healthy, and vital life, just find people and communities around the world who have already done it, and copy them! Dr. Kahn explains what Blue Zones are, and how you can benefit from learning about the people who live in them. If you develop a chronic disease, are you genetically cursed? Or is it actually within your control? If you guessed the latter, then you’re spot on. Dr. Kahn explains why and how there IS something you can do about chronic conditions. These days, it seems as though everyone wants to slow down the aging process—and rightfully so! Dr. Kahn will fill you in on some key aspects of aging, how they can make you age faster or slower, and how to use them to your advantage. Did you know that there are elements floating around your body, potentially weighing on your health and reducing your chances of growing old with grace and vitality? Dr. Kahn arms you with all you need to know to avoid these anti-aging disruptors. The food you eat can actually impact the genes in your body, turning off the ‘bad’ ones and turning on the ‘good’ ones. Here, you’ll learn how to use food in your favor when it comes to battling the aging process. Should You Try Chelation Therapy? Technology isn’t just good for email and social media. In this module, Dr. Kahn explains how to use saunas to promote a longer lifespan, how to hack your way to better sleep, and how intermittent fasting can help keep you feeling younger, longer. In your (almost!) last module, Dr. Kahn reviews the key takeaways from this class, and summarizes how you can use what you’ve learned to live a longer, happier life. 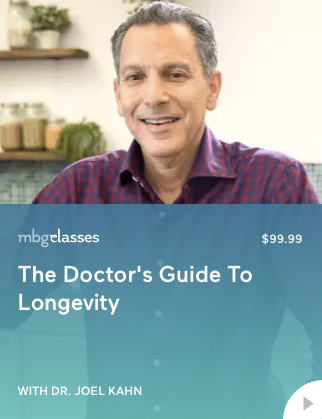 Dr. Kahn leaves you with a few tips and tricks to make sure you have everything you need to know on your journey to living longer, and with more health and vitality. Tips & Tricks #1: Are Saunas The Key To Good Health?